Lux Helsinki is a five-day light festival in the centre of Helsinki that is organised annually at the beginning of January. 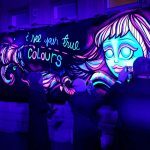 The festival presents a diverse range of light art along a new route each year that covers a few kilometres. In addition to the most famous buildings in Helsinki, the route also highlights lesser known courtyards and facades. Paintings at Ultra Violet Gallery. 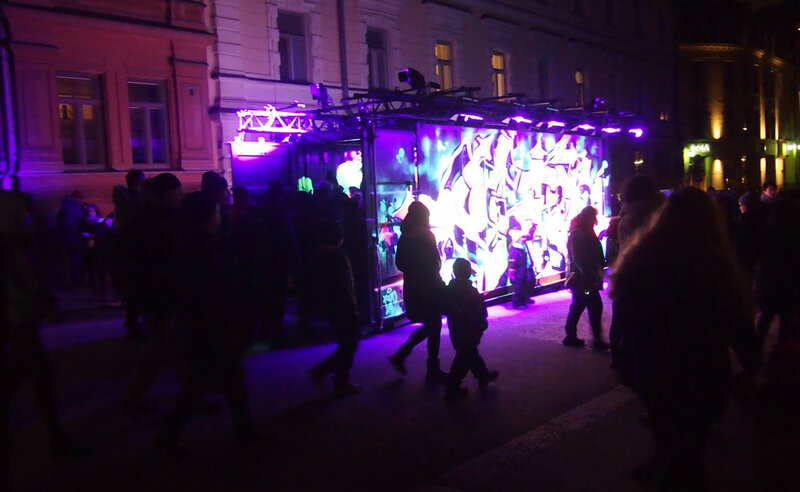 Acton TMF / UVG / Lux Helsinki 2018. Sellekhanks / UVG / Lux Helsinki 2018. 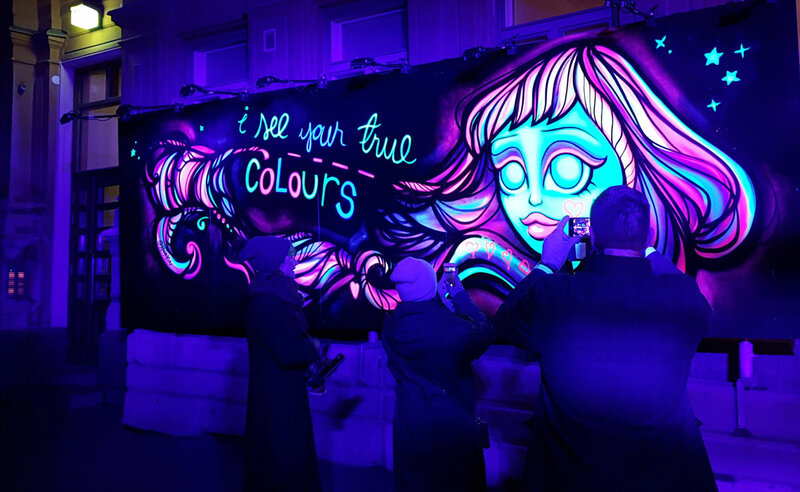 "I See Your True Colors" by Ninakuu / UVG / Lux Helsinki 2018. "Love one another" by Psyke / UVG / Lux Helsinki 2018. 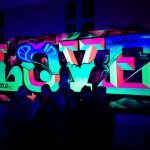 The programme features specially commissioned new works and popular installations for international light festivals. Over half a million visitors come each year to admire the festival, which is organised by the City of Helsinki. 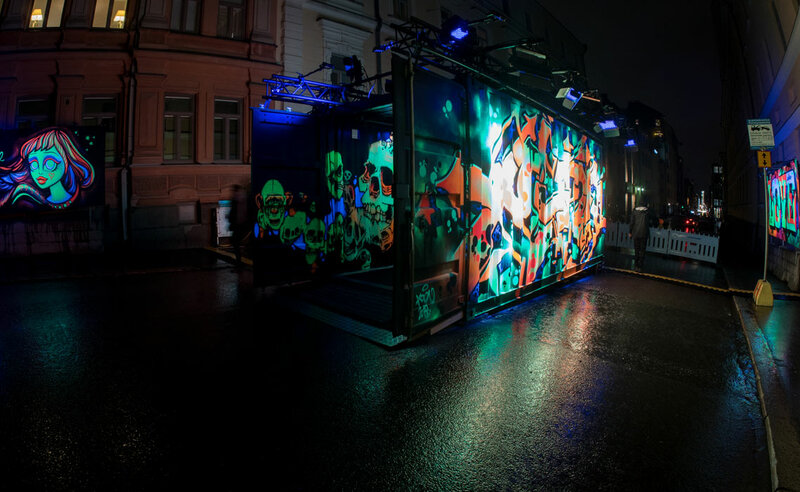 Ultraviolet Gallery consists of a container and two specifically built walls for the event on Kasarmikatu (Helsinki) that were painted using neon spraypaints. The paintings were lit with ultraviolet lights which gave the paintings somewhat eerie glow. 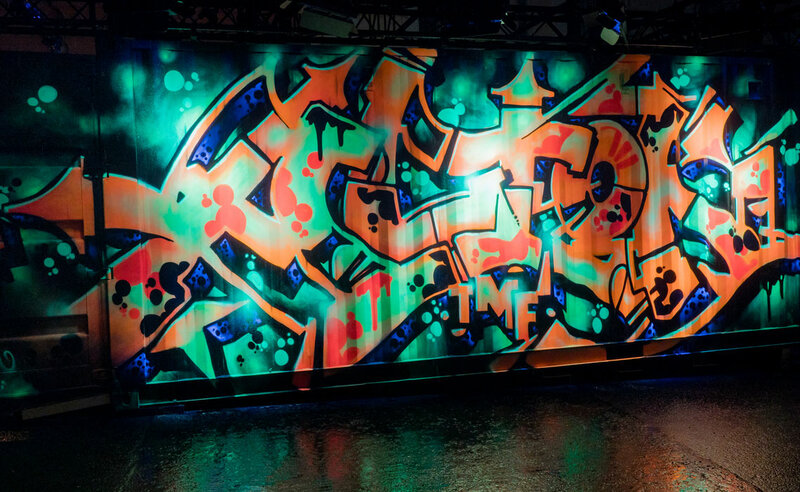 The glowing graffiti art was created by six leading Finnish graffiti artists. One of the painters, Sellekhanks, was also the curator of Ultraviolet Gallery. 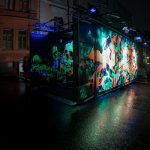 “Ultraviolet Gallery is a joint work by six Finnish graffiti artists that has been created by utilising ultraviolet radiation on a shipping container. 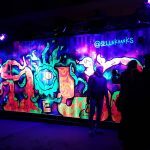 The brightest neon colours of the installation gain a whole new life when observed using black light. 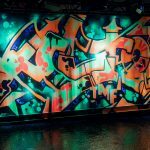 Like graffiti, long-wave UV radiation creates big costs each year for man-made surface structures – cracking, colour changes, fading and blistering are common problems. 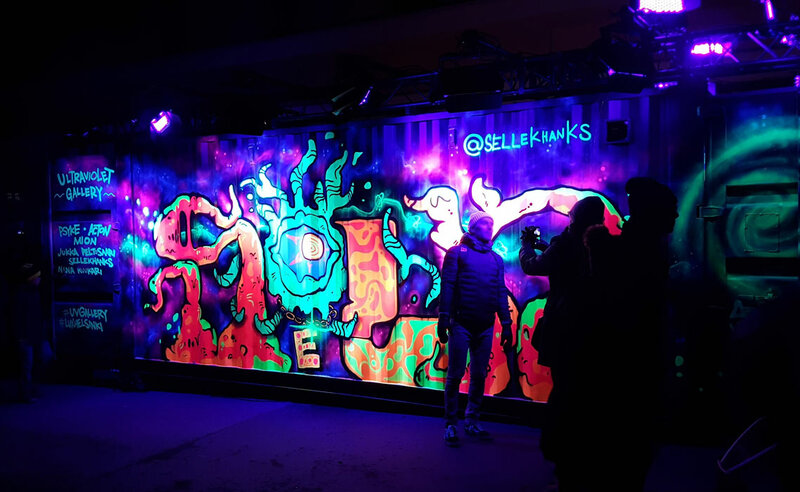 Our group UVG explores the connection between these two concepts by adding the style and aesthetic form language of each of our artists to the raw surface of a shipping container,” UVG describes. 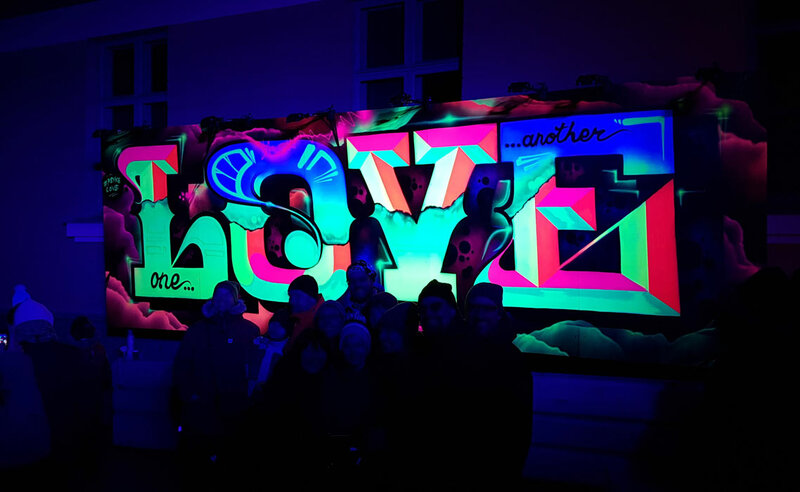 The complete line up of graffiti/street artists for the event was Sellekhanks (curator), Psyke, Mion, Jukka Peltosaari, Ninakuu and Yours Truly. 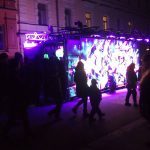 unfortunatelly I didn’t manage to take proper pictures of our artwork due to heavy traffic at the event, so if interested, I really recommend searching Instagram and other social media platforms for much, much more pictures that the visitors took at the scene and shared for everyone.